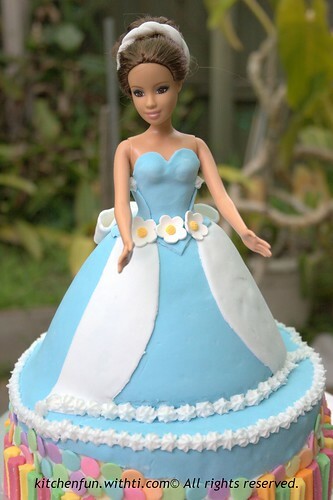 After being a long time dreaming about decorating barbie cake, this time i can't resist to dress her :) . 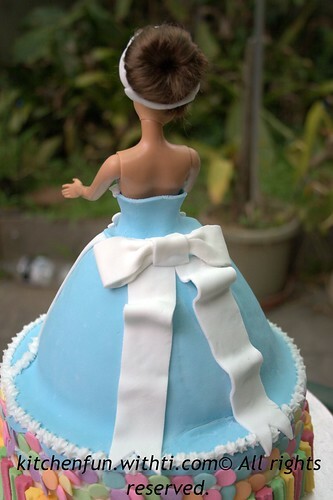 Still simple and the same idea with previous cake it's ribbon theme... also i used the left over fondant blue and white (and I'm not yet confident with variety or brighter colour), the dress cake i made with instant butter cake package, on the barbie dress mould,and dummy cake as the base. 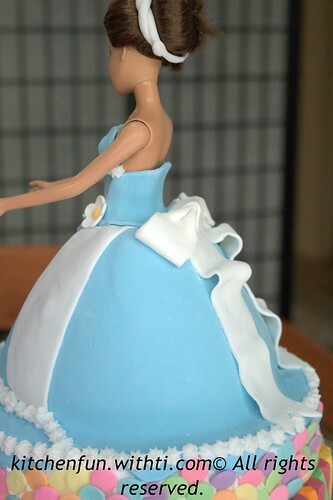 The texture is smoother this time, especially the ribbon, i tried to do it very carefully and patient, i feel that my work paid off with the good result. So what do you think? cantik barbienya..that's what I think...good job! duh cantik banget barbie nya .. bikinin dunk tii ..
Febrie: sini gw bikinin, nanti kirimnya lewat ferry ya, hihi... gak tau nyampenya kapan di Jakarta, whaahaha..